Rhizome | Wed Mar 1st, 2006 8 a.m.
Marjan van Mourik | Wed Mar 1st, 2006 9:48 a.m.
and Kate Armstrong + Michael Tippet's 'Grafik Dynamo'. Electronic Media Arts Centre from February 24 - March 25, 2006.
the work and the formal perameter that comprises its structure. Marisa Olson | Thu Mar 2nd, 2006 2:02 a.m.
Shu-Min Lin's work Inner Force applies to the practice of the wu-wei principle of Taoism, which means "action without competitive or selfish goals". A pool of water is projected on the floor. Participants have to compete to fill its surface with lotus flowers or to catch as many of the carp swimming in the water as possible. Electroencephalogram probes are attached to the viewers' heads to measure the alpha wave activity of the brain. Forcing things does not work, the more peaceful the posture and the mind, the more successful the effort. - To experience Wave UFO, by Mariko Mori Wave UFO, viewers are outfitted with electrodes, which gather brainwave data. This information is transformed into visual imagery and projected onto the screen. The forms change shape and color in response to three types of brainwaves. Alpha (blue) waves indicate wakeful relaxation, Beta (pink) waves indicate alertness or agitation, and Theta (yellow) waves indicate a dreamlike state. - Relax To Win, a game where victory is achieved only by out-relaxing your opponent. Electrodes on your hand measure your galvanic skin response and send the data by wireless connection to a PC or cell phone screen. I played with it at Next last November and lost. Of course. - The Journey to Wild Divine: players must control their heart rate and stress levels to bring responses in line with the demands of the game. - In Brainball, players' brainwaves control a ball on a table, and the more relaxed scores a goal over the opponent. Inner Force can be seen until August 27 as part of Ars 06, at Kiasma, Helsinki. Image from Hotlog. Check also Shu-Min Lin other piece, Glass Ceiling. Julian Bleecker has finally posted his "Manifesto for Networked Objects" in which he discusses "Why Things Matter". Julian elaborates on a variety of issues connected to the "Internet of Things", populated by "Blogjects" or "Spimes" that collect and disseminate information, making us eventually rather live "in" than "on" the internet. Besides being highly recommended reading in this case, a manifesto is something that is published to incite debate about the subject. What's your take on the networked world of objects? Will things become relevant in the creation of "meaning", will they become elevated to agents with the status of "first-class citizens", even advancing "trans-species dialogue"? Or is the creation (and consumption) of relevant information exclusive to human agents (read: bloggers)? What's for certain: it is always good for artists, designers and researchers to write a manifesto when they feel that something big is in the air. 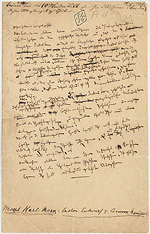 Pictured above: draft for the communist manifesto in Marx' original handwriting. Marisa Olson | Thu Mar 2nd, 2006 2:06 a.m.
One particular highlight was Mauricio Ancalmo's 1871©. Within a small theater, a 16mm film projector, black leader film loop and a sewing machine mesmerized a roomful of people for little under an hour. The film loop was lead through the projector, up to a hook on the ceiling, and under the foot of the sewing machine such that the needle punctured holes into the film allowing spots of light to hit the screen as they passed by the lamp on the projector. 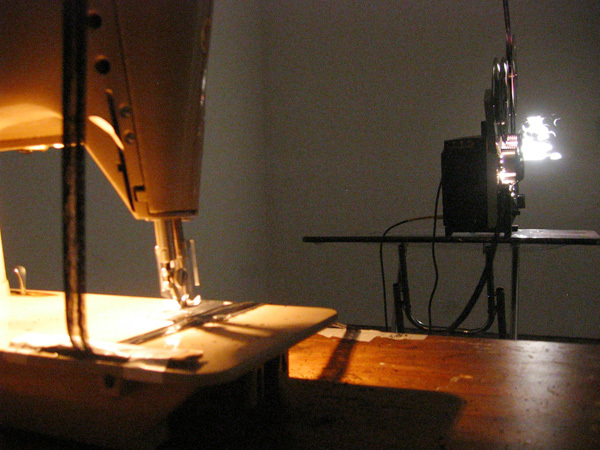 As the sewing machine diligently deconstructed the film, it simultaneously constructed an image projected on the screen. This deconstruction invoked a sense of commitment in the audience. As the film grew weaker, the attention of the audience and the light pouring through the growing number of holes on the film intensified- a collective anticipation of the collapse of the material mounted, as this would also represent the end of an intensely engaging performance. constructing the image projected. The film becomes an artifact for this performance/sound installation that tells a similar story of dark versus light." Marisa Olson | Thu Mar 2nd, 2006 3:18 a.m.
Karl Klomp is fascinated with what he calls 'hyperkinetic audio visuals' - this he attains through video circuit bending, video interruption, hardware interfacing and programming. It seems much of his glitch output, and very tasteful it is too, comes via repurposing video mixers or even burning DVD's with 'impossible bitrates' for challenged DVD players to read - a great concept indeed. Check out the stills page --where you can find some nice circuit-bent playing fields (srvl_77) and some glossy prints courtesy of a second hand video printer (Sony CVP-M1E) bought for 7,50 with extra cartridge and paper! Karl is also one half of the VJ and live cinema performance act Totek, based in the Netherlands. Marisa Olson | Thu Mar 2nd, 2006 3:26 a.m.
Marisa Olson | Thu Mar 2nd, 2006 3:29 a.m.
Marisa Olson | Thu Mar 2nd, 2006 3:33 a.m.
Marisa Olson | Thu Mar 2nd, 2006 4:03 a.m.
Leonardo Abstracts Service (LABS), consisting of the English LABS database and Spanish LABS database, is a comprehensive collection of Ph.D., Masters and MFA thesis abstracts on topics in the emerging intersection between art, science and technology. Individuals receiving advanced degrees in the arts (visual, sound, performance, text), computer sciences, the sciences and/or technology that in some way investigate philosophical, historical or critical applications of science or technology to the arts are invited to submit abstracts of their theses for consideration. The English LABS and Spanish LABS international peer review panels review abstracts for inclusion in their respective databases. The databases include only approved and filed thesis abstracts. Abstracts of theses filed in prior years may also be submitted for inclusion. In addition to publication in the databases, a selection of abstracts chosen by the panels for their special relevance will be published quarterly in Leonardo Electronic Almanac (LEA), and authors of abstracts most highly ranked by the panel will also be invited to submit an article for publication consideration in the journal Leonardo.